We have been promising to get back to the topic of capital destruction, which we put on hiatus for the last several weeks to make our case that the interest rate remains in a falling trend. Today, we have a different way of looking at capital destruction. Socialism is the system of seeking out and destroying capital. Redistribution means taking someone’s capital and handing it over as income to someone else. The rightful owner would steward and compound it, not consume it. But the recipient of unearned free goodies happily and uncaringly eats it up. Socialism is not sustainable. It inherits seed corn from a prior, happier system, and it lasts only as long as the seed corn. There are different flavors of socialism. The 20th century witnessed an aggressive totalitarian form. Both communism and Naziism feature military occupation of domestic territory and conquest of foreign lands. Few people willingly feed whatever they have into the sausage grinder of State sacrificial collectivism. And so totalitarian socialism has armed thugs all over the streets, both open military and secret police. There are frequent killings, of those suspected of disloyalty or holding back small scraps. In their constant fear of uprising, they use disappearances, interrogations, and torture to root out the names of traitors to their bloody revolution. Thankfully, the major totalitarian socialist regimes were defeated militarily like the Nazis, collapsed after they depleted all available capital like the Soviets, or reformed like China. Another flavor of socialism is based on so-called soft power. It taxes and regulates every private productive activity, owns and monopolizes some sectors, and promises a minimum level of subsistence to all citizens including food, shelter, and medical care. Unlike the totalitarian forms, this kinder, gentler socialism allows vigorous debate whether the government should criminalize cigarettes, allow people to hail a taxi using an app on their phone, and whether the government should include gender reassignment surgery in the list of medical services to be provided for free. However, as the citizens have mostly gone through government schools, there is almost no debate about whether or not government should take over medical care in the first place. This kind of socialism is not stable. It is either moving towards freer markets, as for example New Zealand famously did starting in the 1980’s. Or it is moving towards government control as the United States infamously did with Obamacare. It’s not stable, because it is rife with contradictions. For example, if I cannot afford my healthcare, and you cannot afford your healthcare, and John and Susie cannot afford their healthcare, then of course we as a collective cannot afford our collective healthcare plus a bureaucracy to manage it (not even counting the waste and corruption). No one with basic economic literacy would believe that. An 8th grader wouldn’t believe it! What makes it popular is the next contradiction. Most people expect to get free health care paid for by someone else. The thought of “free” is so enticing, that people overlook the obvious failings, such as the declining availability and spotty quality. In this flavor of socialism, the destruction of capital is obvious. You can see it in the overworked staff of the National Health Service unable to care for every patient and forced to ration health care and cancel surgeries. You can observe the shabby government projects which house huge and permanent underclasses. You can witness the stagnant economies, which provide little opportunity for business owners to accumulate wealth, fewer good jobs for workers, or hope for the future. There is a third flavor of socialism, which was unfortunately popularized by Milton Friedman. He did not see it as socialism, but as we shall show it certainly is. This type of socialism lacks the totalitarian flavor’s military officers, strutting about and demanding to see your papers. It also lacks the boundless welfare programs and endless Ministries of Micromanagement of Human Life of the softer flavor. I refer, of course, to central banking. Friedman advocated a steady expansion of the quantity of dollars, what he called the K% Rule. Friedman’s followers today favor other rules, for example to expand the quantity in order to grow GDP by what they feel to be the “right” amount. The man most people think to be Friedman’s diametric opposite, John Maynard Keynes, advocated expansion in response to whatever economic problem may come along. Former Fed Chair Janet Yellen, a diehard New Keynesian, wrote a paper in which she argued for printing more dollars—to enable employers to hire more workers. Whether the central bank is to expand the quantity of dollars at a steady rate, to achieve an economic goal, or purely at the discretion of philosopher-kings, the principle is the same. We consider them to be sub-flavors of the same flavor of socialism. The central bank can nudge us for our own good, if not the good of politically connected cronies. What is this nudging? They have found a very clever way to induce people to do as the central planners wish, without the machine guns or bloated bureaucracies. Keynes, citing Lenin, referred to “engaging all of the hidden forces of economic law”. In the same breath, he admitted that it was “on the side of destruction,” but that does not seem to have deterred anyone. What economic law induces people to act? It’s that people act according to incentives. The central bank can change certain incentives. We will leave off the falling interest rate for now, but let’s look at something else the central bank can do. It can make it so that credit is available to companies who don’t even produce enough revenue to cover their interest expense. Normally, such zombies (as they are called) would not be able to obtain credit. Who lends money to a company that will have to borrow more money just to cover the interest? But we are not in a normal world. We are in the third flavor of socialism. And the Fed has made it so that the zombies, who ought not to be able to get credit at all, have gotten mass quantities of it. And this brings us back to our theme of destruction of capital. It should be obvious that it’s destructive to feed credit to a company which cannot pay its cost of credit (and this is in a world of suppressed cost of credit, at that). Zombies wear out machinery that they cannot replace, and pay workers’ wages with borrowed funds that they cannot afford. When the end inevitably arrives, those who lent to the zombie lose their principal. It should also be obvious that zombies add to GDP, at least while they exist. So the GDP targeting crowd sees this as a good thing. And zombies produce goods, thus increasing supply and thus pushing down prices. So the inflation targeters justify even more of the policy that feeds credit to zombies. And zombies employ people, so the unemployment optimizers see the policy as good. Stock prices are also rising, so investors see it as good, not to mention Wall Street. By every conventional macroeconomic aggregate measure, feeding credit to zombies is a Good Thing. This is not an argument in favor of lending to zombies. It is an argument against using conventional macroeconomic aggregate measures. They are misleading. However, they’re used for a reason. They provide cover to this third flavor of socialism, for the central planners who nudge us down the socialist road to the destruction of capital. So how does this nudging work? What is the form of the incentive? They make it profitable to fork over your capital to zombies. People like to make a profit. Who would have known? Here is a chart of an ETF which owns high yield corporate bonds, presumably zombies among them. If you bought in the lows after the last crisis, you could have made capital gains of over 50% in four years (not counting the yield). After that, well it’s not looking so good. However, there is another trade that is still making money. At least for now. Here is a graph of the spread between junk and Treasury bonds (the BofAML US High Yield Master II Option-Adjusted Spread). 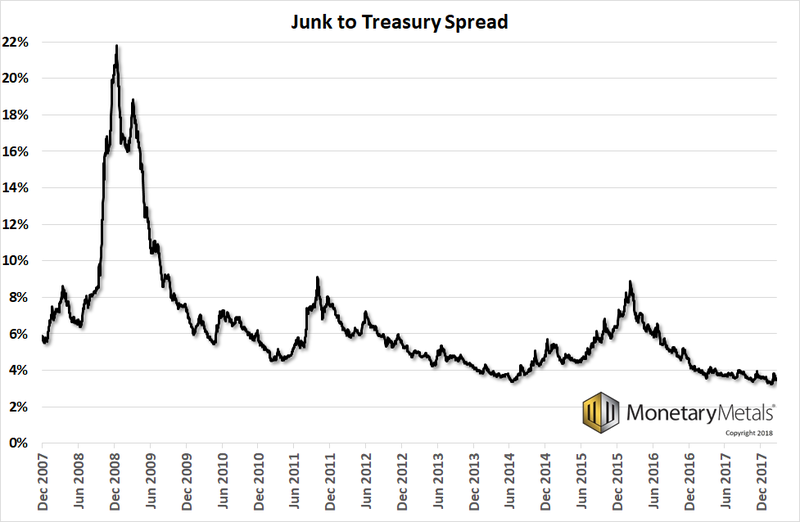 There is currently only a 3.5% difference in yield between junk bonds and Treasury bonds. The way to have played this was to buy junk and short Treasurys. The more this spread narrowed, the more you won. It performed brilliantly until mid-2014. Then you wanted to be out of it until 2016. After that, you had another good run until a month ago. We think this trade won’t be so good going forward. Not because it’s within a point of the all-time bottom. Though it is, and one would have to be worried about that. But because zombies are time bombs waiting to go off. With each passing day, they get closer to blowing up. Don’t forget that they are destroying investor capital, and piling up more debt every day. And also, they get closer to blowing up with each uptick in the interest rate. 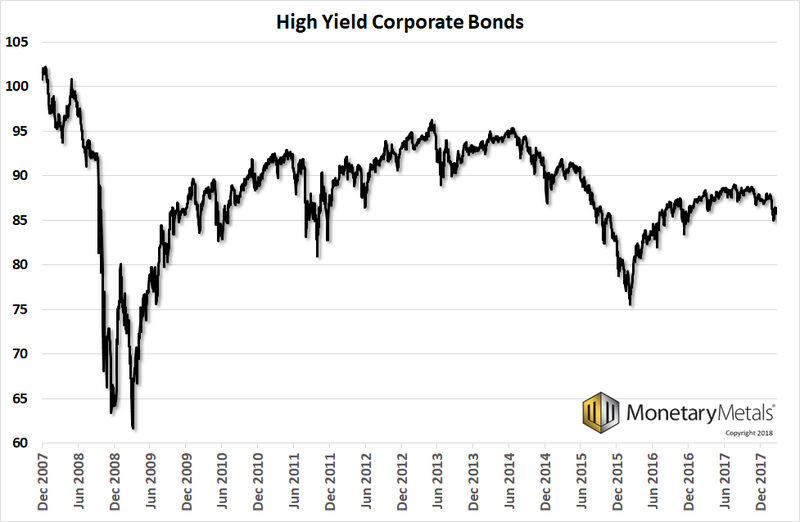 It looks to us like junk bond yields have been in a rising trend for about half a year. LIBOR has been in a rising trend for three years, steepening considerably since September. Lured by profits, investors are feeding capital to zombies, who destroy it. They do it because the Federal Reserve has made it profitable to do so. Keep in mind that employees of zombies buy houses, remodel kitchens, buy cars with 0% financing for 72 months, eat at restaurants, buy Swiss watches, etc. One could look at the major creditors of the zombies and their biggest vendors, and predict the impact to those entities. But beyond that, it is impossible to determine the full impact. The problem has grown very big. Contrary to Milton Friedman, we argue that a central bank brings a flavor of socialism. The means may be different, but like the other flavors, the central banking flavor seeks out and destroys capital. The capital destruction is less obvious, especially if you look only at conventional macroeconomic measures such as GDP and unemployment. You must look at falling marginal productivity, or the rising number of people who are neither employed nor unemployed. We need to evolve away from central banks, socialism, and a policy of capital destruction. We need to move forward towards the gold standard, the monetary system of a free market. The monetary system where capital is accumulated, not consumed. The prices of the metals fell, $22 and $0.24 respectively. It’s an odd thing, isn’t it? Each group of traders knows how gold “should” react to a particular type of news. But they all want the same thing—they want gold to go up. And when it doesn’t, many hesitate to buy. Or even sell. This is why speculation cannot set a stable price (I’m talking to you, bitcoiners). 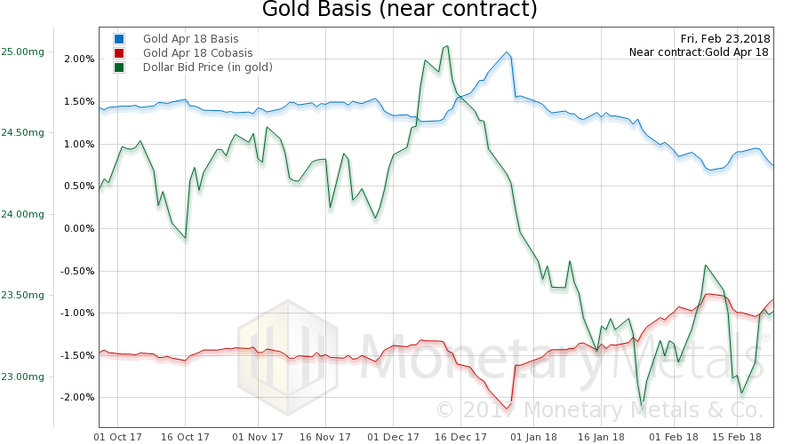 So long as gold’s sole purpose is to bet on its price to make real money—we’re talking dollars here, baby!—then the trading action is like a giant Ouija Board, with each group having a thumb on it. You have the Indian jewelry buyers, the inscrutable central banks like China, the Wall Street firms, the gold bugs, the hedge funds, etc. When enough of those thumbs desire to push gold in the up direction, it goes up. Of course this isn’t gold’s purpose, but that’s what is commonly believed. It is endlessly fascinating as it is endlessly moving around, if not in the directions and for the reasons that gold analysts think. This is the dynamic we study, the interplay between buys and sellers of real metal, buyers and sellers of futures, and market makers. Many gold analysts see only the short futures position of the market makers, and conclude that they are pushing the price down. The long metal (or gold receivable, e.g. from a miner) is not reported in the Commitment of Traders report). So they misread the market. Plus, a quantity approach to position size (as with quantity of dollars or anything else) does not tell you much. Note that tiny rise in scarcity (i.e. cobasis, the red line) as the price of the dollar rose (inverse of the falling price of gold, in dollar terms). That is the typical pattern. 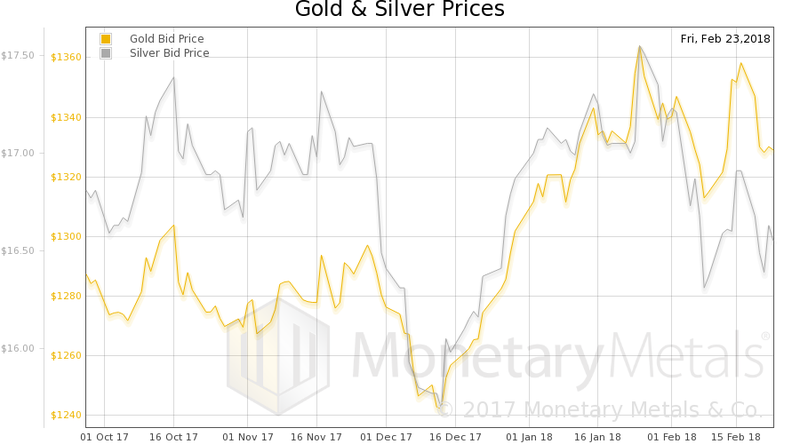 The Monetary Metals Gold Fundamental Price fell this week, to $1,387. Now let’s look at silver. The same occurred in silver. 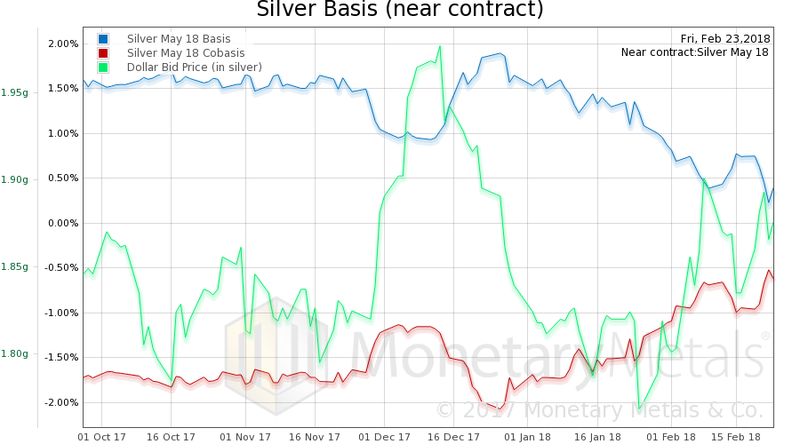 The Monetary Metals Silver Fundamental Price fell 7 cents to $17.12. 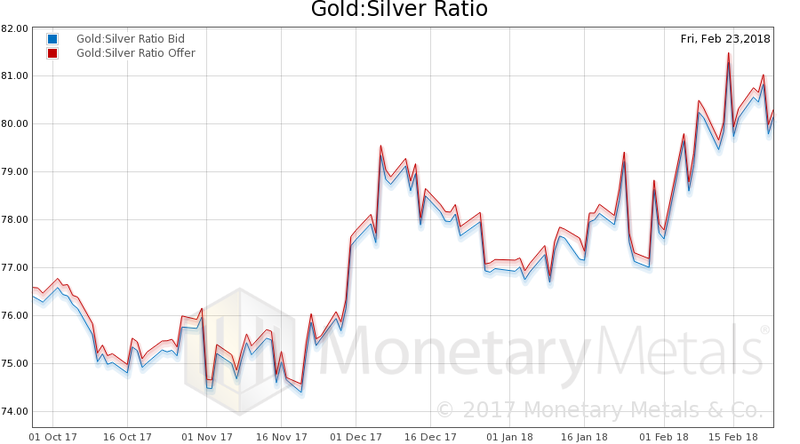 Interestingly, the Monetary Metals Gold Silver Fundamental Ratio fell in a week when the fundamental prices of both metals fell. It is now 81.05.